The MDS-JE500 features an 8x oversampling, 18-bit playback digital filter for increased stereo imaging and higher levels of accuracy. A pulse D/A converter minimizes zero-cross distortion, considered the most audible distortion in digital components. As a result, smooth, open sound can be achieved. The hybrid converter design of the recorder places the playback digital filter and D/A converter on a single IC chip to create shorter signal paths. The MDS-JE500's Shock Resistant Memory (SRM) buffer can hold up to 10 seconds of music for uninterrupted playback, even if the unit is accidentally jostled. SRM also allows for nonlinear recording and playback; users can start recording a 5-minute song in a 3-minute gap and automatically continue elsewhere on the disc without interrupting the recording or playback processes. The MDS-JE500 also features a Jog Dial for split-second track access, allowing users to skip forwards or backwards through tracks. 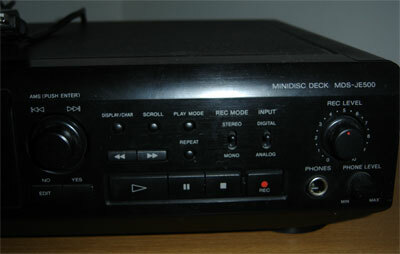 Further increasing the versatility of the unit is the ability to scroll through the recorder's alphabetical display and input disc and track titles. Three play modes are featured: Continue, Shuffle and Program, giving users the ability to repeat a disc or song, or repeat between any two designated points. In addition, 25-track programming enables songs to be played in any sequence, and a 25-track music calendar provides a visual display of songs played, songs remaining and songs programmed. A Text Entry feature lets users customize recordable MiniDiscs with up to 1,700 characters per disc. The MDS-JE500 boasts several powerful editing capabilities. Through the Table of Contents, users can erase one or all tracks, or combine, divide and move tracks. The Smart Space feature provides a uniform, three-second space between all songs, and Auto Cut Record Pause places the unit in Record Pause mode after recording 30 seconds of silence. 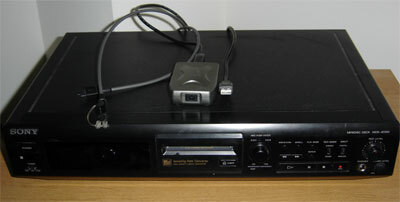 The CD Synchro Record feature coordinates the Record and Pause modes with Sony CD players, and optical inputs and outputs allow for direct connection from a CD player or DAT recorder. Other features of the MDS-JE500 include: a Headphone Output with volume control; and a Remote Commander® remote control with 25-key Direct Access_ track selection, title input and power on/off. Weighing seven pounds, two ounces, the MDS-JE500 is currently available at a suggested list price of $200. Player is in excellent physical and electrical condition. 20 Blank Minidiscs included in auction. No Remote Included. Buyer will pay $18.00 packing and shipping in the continental United States. Payments accepted are Paypal, cashiers checks and money orders only. No international buyers unless Paypal verified. Please feel free to contact us if you need other arrangements.